The U.S. economic downshift into a more moderate rate of expansion has marginally impacted consumer spending. Weakness in the national recovery was evident in top-line May retail sales, as total receipts slipped for the first time in 11 months. The drop in May sales, however, was beset by rising energy prices and supply-chain disruptions that weighed down auto sales, factors that will prove temporary. In May, consumers demonstrated their ability to overcome rising gas receipts, as core retail sales excluding auto and gas, continued to rise. 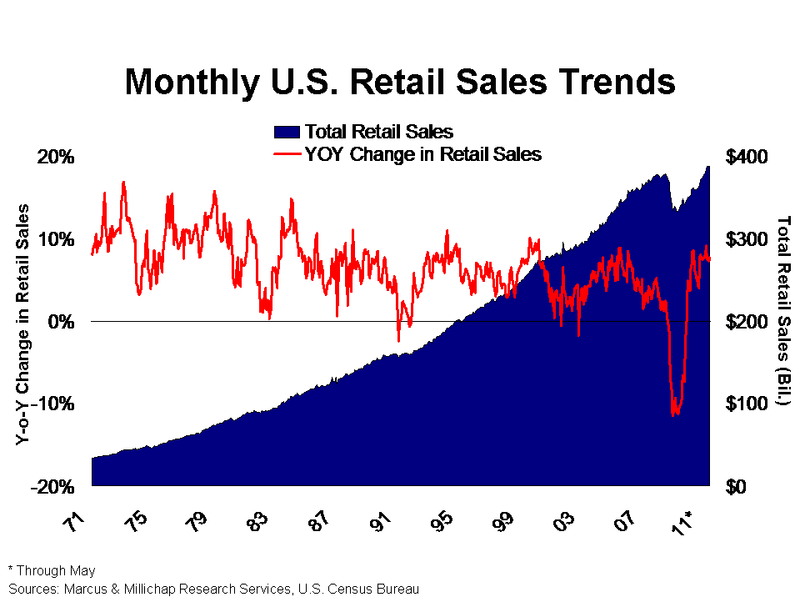 More importantly, core retail sales long-ago exceeded pre-recession highs. With fuel prices ebbing and providing Americans some expense relief, household purchases, which account for 70 percent of the economy, should improve and sustain economic expansion in the coming months. Core retail sales rose 0.3 percent in May, up 4.4 percent above the previous peak in July 2008, but consumers remained hesitant to purchase big-ticket items. Automobiles and electronics and appliances experienced the most significant declines, with store sales falling 2.9 percent and 0.7 percent, respectively. Internet retailers continued their string of gains, however, rising 1.2 percent, matched by building supply stores. Restaurants and bars also continued their gains, posting a 0.6 percent increase in May sales. The Conference Board index of leading indicators, which predicts economic activity, rose 0.8 percent in May, providing another reinforcing sign that the U.S. economy remains poised for continued, albeit slow, growth. The building permits component contributed significantly to the index’s better-than-expected increase. This trend, in addition to strong May sales at building material stores, is a welcome indication that residential construction activity may be primed to stabilize this year. Moreover, the rise in permit issuance portends an uptick in housing starts in the coming months, which would further lift sales at building and home improvements stores and contribute to stronger overall economic growth. Minimal supply growth, coupled with strengthening economic conditions and rising retail sales will facilitate a downward drift in national retail vacancy through 2011. National chains with healthy balance sheets will progressively capitalize on opportunities to grow market share, though strategic expansion plans will be disproportionately geared toward supply-constrained metros. Major markets such as New York will record one of the nation’s most substantive jumps in occupied stock, while tertiary markets post only tepid gains at best. Nationally, though, net absorption will total more than 93 million square feet of space, outpacing modest additions to inventory, pulling down vacancy 50 basis points to 9.5 percent. Increases in core U.S. retail sales and an overall rise in global consumption will fuel tenant demand for supply-chain oriented industrial properties including warehouse and distribution facilities. As global trade continues to make headway, aided by the weak dollar, warehouse/distribution facilities in port-centric major markets such as Los Angeles and Houston, will steadily lease up through the remainder of the year. A rise in space requirements, coupled with near-record low supply growth will support a 50 basis point reduction in the national industrial vacancy in 2011 to 12.1 percent. This entry was written by marcusmillichap, posted on June 22, 2011 at 1:01 am, filed under Research and tagged Retail Sales. Bookmark the permalink. Follow any comments here with the RSS feed for this post. Trackbacks are closed, but you can post a comment.